Introduces Font Awesome Icons, Header Tags, Page Backgrounds and various commonly used CSS properties for manipulating text in a HTML document. How to use the HTML Header Tags. How to set a Font Family & Font Size. How to add Italic, Underline & Bold. 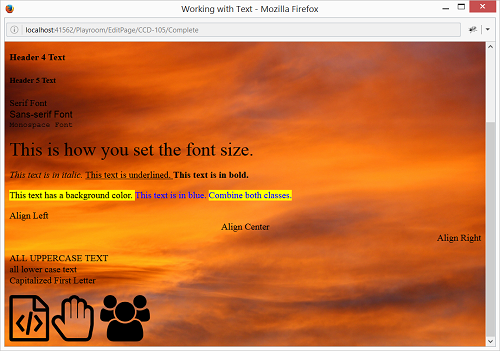 How to set Font Colors & Backgrounds. How to set Page Backgrounds. How to add Font Awesome Icons. Create a page with a background that uses the Font Awesome Icons and as many text manipulation features as you can. The images, icons and text content are up to you.